There are many reasons to be concerned about the wide and growing inequalities in U.S. society, not least between the upper middle class and the rest. There are fewer clear solutions. In Richard’s book Dream Hoarders, he argues that those at the top – the “favored fifth” – can and should take some personal responsibility for their role in perpetuating the advantages that deepen inequality. These individual sacrifices, he argues, could help create a fairer society. But will they? There are some reasons to be hopeful. Affluent, well-educated Americans are increasingly voting Democratic, expressing a preference for liberal and progressive policies. New research suggests that across income and demographic groups, people want to live in a fairer society – even if not a perfectly equitable one. As it happens, we have a real-time test of the “willingness to pay” for fairness underway in Cook County, Illinois. A recent investigation by the Chicago Tribune revealed an unusually regressive pattern in the County property tax assessment system: homes in low-income (and predominantly minority) areas of the city tend to be overvalued by 10 percent or more, while homes in more affluent areas tend to be undervalued by 10 percent or more. An analysis by University of Chicago professor Chris Berry found that from 2011-2015, the average home that sold for $100k paid an effective tax rate of 1.6 percent, while the average million-dollar home paid 1.1 percent. This might feel like a rounding error, but it actually means the tax rate on the $100k home is a whopping 45 percent higher than the tax rate on the million-dollar home. The cumulative result? A disproportionate share of Cook County’s total $14 billion in annual property tax collections are paid by the people who are least able to absorb the extra cost. Inequality is a complex, multidimensional problem. But in this specific instance, there is a relatively simple, straightforward, and technocratic fix. A new property tax assessment system that would result in more accurate, efficient, transparent assessments – and a less regressive system overall –has already been designed, tested, and delivered to the assessor’s office. Yet evidence suggests it has not yet been implemented and a formal study to review the situation has been months in the making. What would a reform of the current unfair system look like in practice? Let’s take two properties sold in Cook County in 2011: a $309,000 home in the relatively affluent North Park neighborhood of Chicago, and a $130,000 home in the southwest suburb of Stickney. Under the existing scheme, the North Park home was assessed at 90 percent of its total value – $281,100 – while the Stickney home was assessed at nearly double its value — $238,660. Using a uniform tax rate to estimate the property tax bills, the North Park homeowner would pay $5,100 and the Stickney property owner $4,300 in taxes. Under a system that assessed the two properties at closer to fair market value, the North Park owner’s tax bill would rise, but only marginally – to $5,900, while the Stickney homeowner’s bill would fall to $2,400. Nobody likes a tax increase. But it is not difficult to see why an $800 increase in the annual tax bill for a North Park resident, where 50 percent of residents hold a college degree and the median household income is $71,000, would be easier to absorb than the $1,900 additional taxes that the Stickney resident is already paying – in a community where the median household income is $43,000 and only 10 percent of residents hold a college degree. So much for the economics. Now for the politics. Overall, Chicagoland’s residents are a liberal group: 73.9 percent voted Democrat in the 2016 presidential election. They presumably value a fairer, and perhaps even a more equal society. This property tax assessment reform moment presents a real-time opportunity to show that they are willing to pay—just a little—for it. And if they are not persuaded by a purely moral argument, it its worth making an economic one: inequality may be a costly drag on the entire regional economy, as a recent study by the Metropolitan Planning Council and Urban Institute study has shown. Some of the less affluent Chicagoans who are losing out under the current assessment system are beginning to organize for reform. The question is whether they find enemies or allies among the affluent who stand to lose just a little in return for the chance to live under a fairer taxation regime. Perhaps this seems like a local story. But the stakes are quite high. 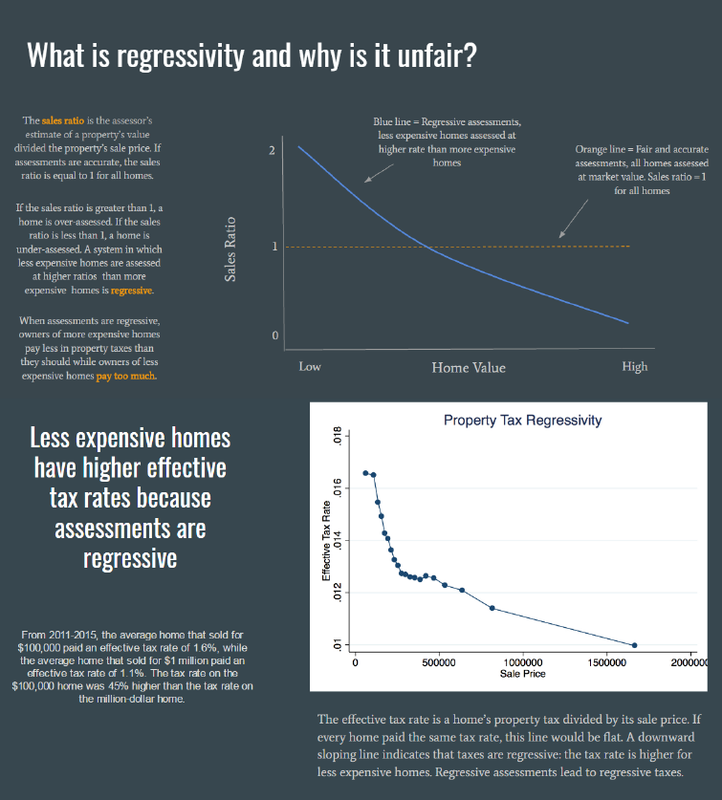 After all, if even liberal affluent Chicago residents are not willing to a pay a little more to correct a proven unfairness in property tax rates, what hope can we hold out for broader redistribution?